Tucson Daily Photo ~: Have a SWEET holiday! What are you doing today to celebrate the nation's birthday? 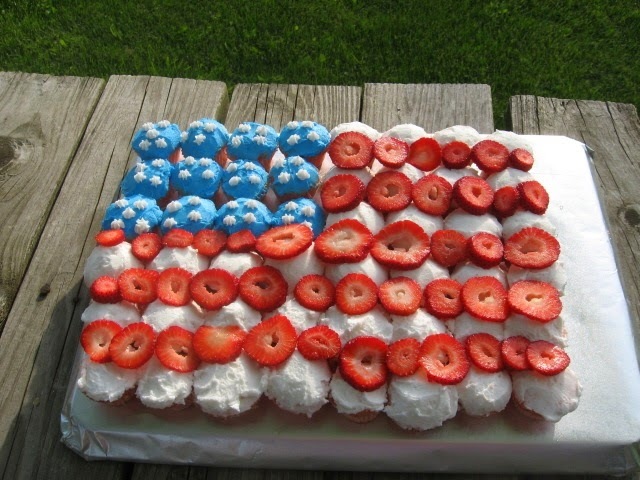 Clever flag-cake idea, I'd love a bite! I see from the weather channel that you could be singing from The Sound of Music: "Raindrops on cactus and puddles on pavements", finally some monsoon action! We' re just doing the usual thing here, bar-b-q burgers and hotdogs, then watermelon, then fireworks. We're in the county and can fire them up right here! Hope "A" Mountain doesn't catch fire..haha :-) Oh, and we also love to watch "A Capital Fourth" on the PBS station...do you watch it?